For more than 35 years, the team at Schaefer Inspection Services has been performing home inspections, checking out houses in Connecticut from top to bottom, inside and out, making sure every nook and cranny is accounted for. And for almost that entire 35 years, we’ve been getting asked the same round of questions regarding home inspections and what to expect. Here are some of the most frequently asked questions our clients have. Q: When do I need to have a home inspection? A: Home inspections are customarily performed once you have made an offer to buy a home, and that offer has been accepted, and during your specified 7-10 day inspection period. While it’s not legally required to have a home inspection done, one could be required by your lender. We also recommend a pre-market inspection for homeowners selling their home. We suggest this because it can help to sell your home more quickly, and for more money, by addressing issues that can add to the value and appeal. With a pre-market inspection, our inspectors will find issues that need to be addressed before the buyer’s inspector does. Q: How much will my home inspection cost? A: It depends on a few factors. The inspection fee is calculated by considering the size, age and any additional buildings on the outside. If the home has been vacant for a while, it is especially important to have it inspected because an empty home can often be a neglected home. Every inspection company charges different rates. Give us a call today to get an accurate estimate on your home’s inspection. Q: How do I find a reliable inspector? Can’t I just have a friend who knows a lot about houses check things out for me? 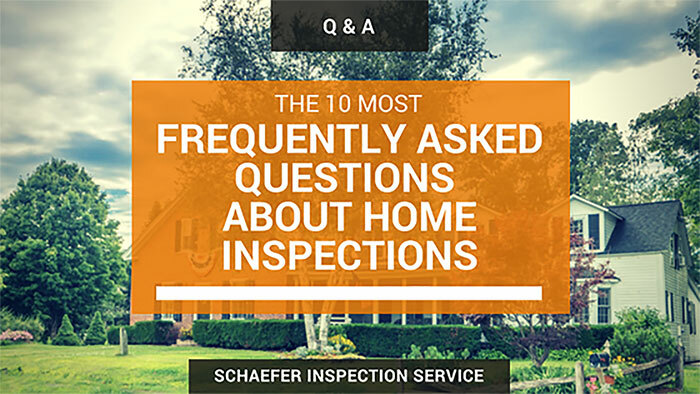 A: You should make sure that your inspector is experienced, licensed, knows the area, and adheres to state standards (all of Schaefer’s seven inspectors are fully licensed and have more than 100 years of combined experience performing inspections in Connecticut. They all follow a thorough, complete process for each inspection). If you live outside of Connecticut, ask your realtor for a recommendation or click here to search the American Society of Home Inspectors (ASHI) database. And your friend the plumber or the roofer? He may know a thing or two when it comes to fixing things around the house, but it’s possible he could miss something when inspecting your entire home. He likely will not be knowledgeable about all the systems of the home as a competent home inspector must be. A: The length of the inspection appointment depends on the size, age, and condition of the home. We estimate a minimum of an hour for a condo and several hours for a much larger property. The inspector will inspect until he feels satisfied that he has seen everything he needs to. We always try to be efficient while also being thorough. Q: Do I need to be there for the inspection? A: It’s always best if everyone involved, both the buyer and the seller of the property, are present for the inspection. Sellers generally know a lot about the home and can answer questions about different aspects of the house. At Schaefer, we want home buyers to be well-informed about their new property. We’ll walk them through the house, explain how the different systems work, and point out what we’re putting in our report. Q: What parts of my house will they be looking at? A: A home inspection is a thorough visual check of your home. While we won’t be opening up your walls or picking up floor boards, we will, at minimum, look at your house’s foundation, floors, walls, ceilings, siding, exterior trim, doors, porches, surface drainage, walkways, driveways, patios, steps, skylights, fireplaces and chimneys, roof coverings and drainage, water and waste pipes, water heaters, sump pumps, electrical systems and panels, heating and cooling systems, vents, cabinets, counters, attics and crawl spaces, basements, laundry rooms, and windows, among other areas. Q: What will the inspectors find? A: Your home is a series of systems (much like your body) that all work together. We’re looking to see if the home has been constructed to “live” properly. Every house has issues, even brand new ones. We’ll let you know what systems look good and what needs maintenance or repair. Our goal isn’t to alarm, but rather inform the buyer so you can make good, sound decisions. Q: What happens if they find something wrong with my house? A: We’ll take a picture, explain what’s wrong and what the repair might be to fix it (all of this will be included in the detailed report we provide post-inspection). The inspector may recommend bringing an specialist for some issues in to investigate further. Q: Can my house fail an inspection? A: We never pass or fail a home we inspect. We will always be looking for safety issues, things that are not functioning, as they should, and systems that are nearing the end of their service life. We will always recommend bringing in a specialist for further investigation or to give cost estimates for work needing to be done. Q: Will my home be up to code once my inspection is completed? A: Building codes are different in every city and town and often change from year to year. Our inspections are for safety and structure, and mechanicals, not code compliance. If you have any other questions about home inspections or would like to schedule one today, give us a call at 1-800-345-2776. You can also reach out to us on our Facebook page here or tweet us @SchaeferInspection.